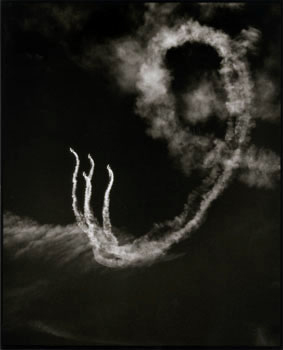 Returning to Chicago after several years, Ryan Zoglin blocked off four days to photograph the Chicago Air Show. 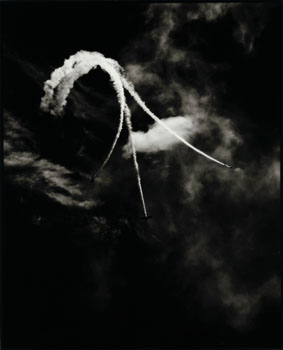 His strikingly graphic images exude romance, demonstrating the aerial acrobatics of the jets. Bordering on the abstract, the airplanes’ trails create lines and shapes reminiscent of skywriters. 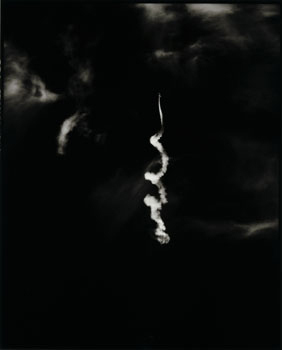 Zoglin’s works, from his series Airshow, also touch upon America’s fascination with the technology of flight. Educated at the Rochester Institute of Technology and the School of the Art Institute of Chicago (BFA, 1991), Zoghlin has also worked as a photographic illustrator since 1990. His works have most recently been exhibited at the Evanston Art Center; the Flatfile Gallery, Chicago; and ART of the Central Coast Art Gathering in Morro Bay, CA.